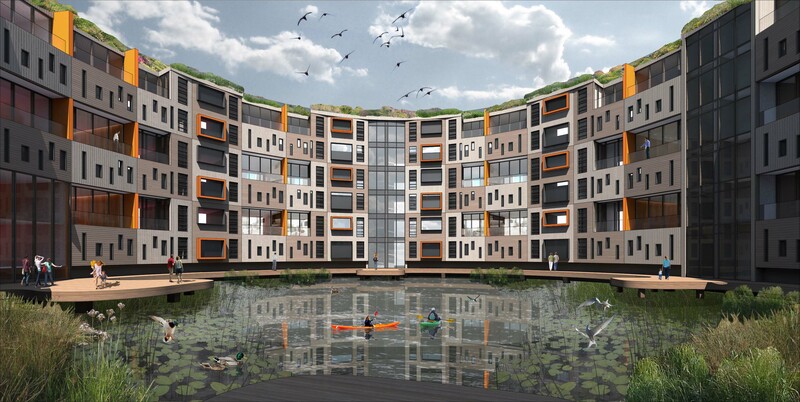 Providing a meaningful contribution to the housing requirement through the introduction of housing and water amenity across the whole portfolio of National Grid gasholder sites. to solve the housing crisis and over the last decade since the issue became critical we haven’t even come close. So, our proposal is simple, wherever possible, these valuable and often strategic sites should be used for new housing. 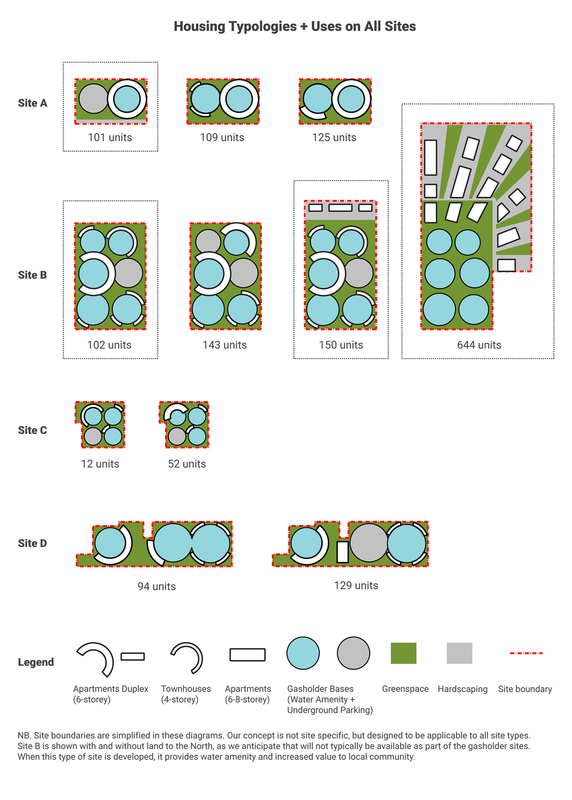 Some sites will inevitably not suit new homes and these should be the target of leisure or amenity uses, but for the main part a series of repeatable and scale-able housing typologies should be developed to make use of these sites. 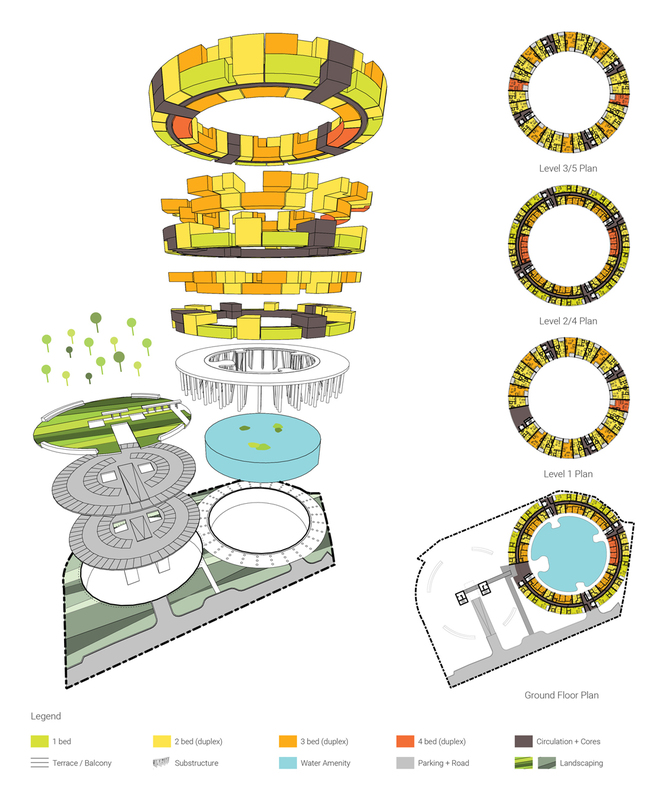 We believe that the gasholder bases on these sites should be used for their intended purpose as vessels for water. The presence of water (rivers, lakes, ponds or the coast) adds value to housing. Estimates vary between premiums of around 12% and 81%, depending on the location and situation, but waterside living provides a consistent premium to housebuilders. 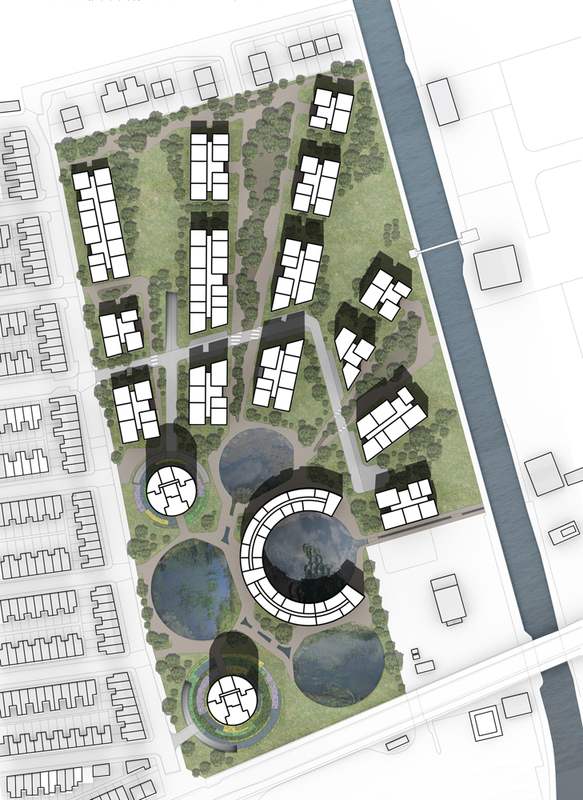 By cleaning, repairing and waterproofing where necessary, we believe these gasholder bases can provide attractive and useable amenity for a range of housing typologies specifically designed to maximise water frontage. When comparing the site preparation costs of infilling the bases with solid fill versus filling with metered mains water, it is 40% cheaper with water. 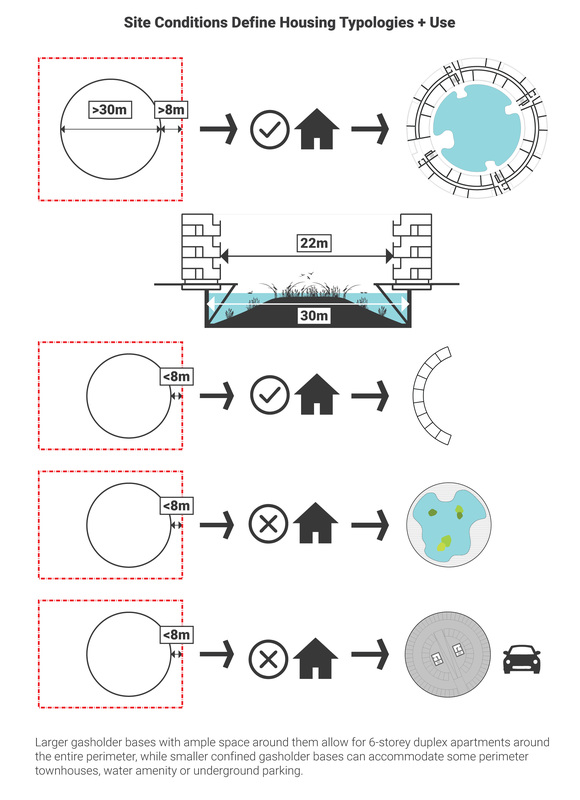 The water required to fill the gasholder bases could come from rainwater or diverted from a canal, where applicable. Drainage could be managed with a series of swale channel systems and greywater recycling systems would be implemented to cover 50% of household usage. The habitat creation from these water bodies has ecological benefits and economical benefits could result from using the water bodies as an energy source via water source heat pumps. 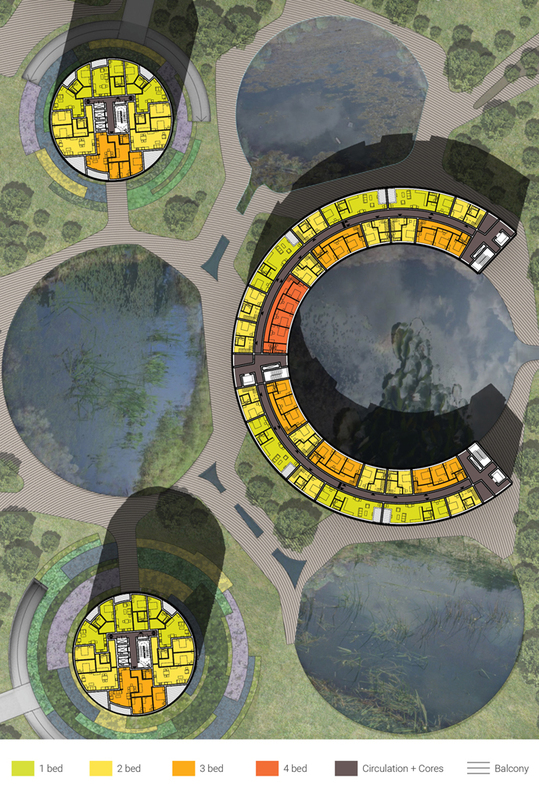 Different site conditions can accommodate varying densities of housing all benefitting from new and economically created water amenity and underground parking (where required), depending on the diameter of the gasholder base and the distance between gasholder bases and each other/the site boundary. 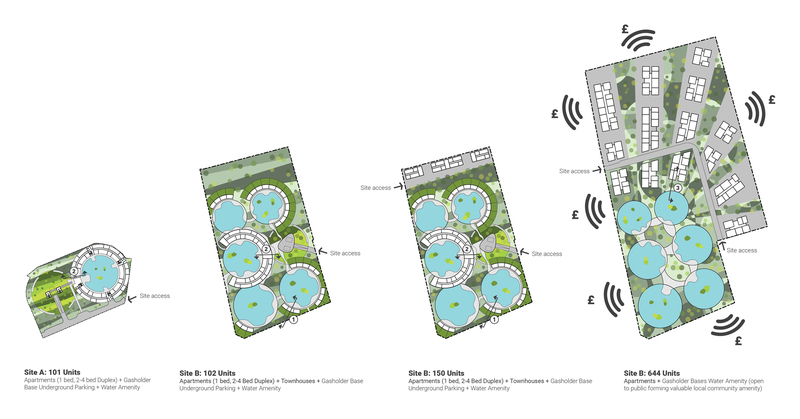 All viable sites can contain one or multiple housing typologies with varying relationships and proximity to the water.